Winter in Yellowstone National Park, Lower Falls of the Yellowstone. 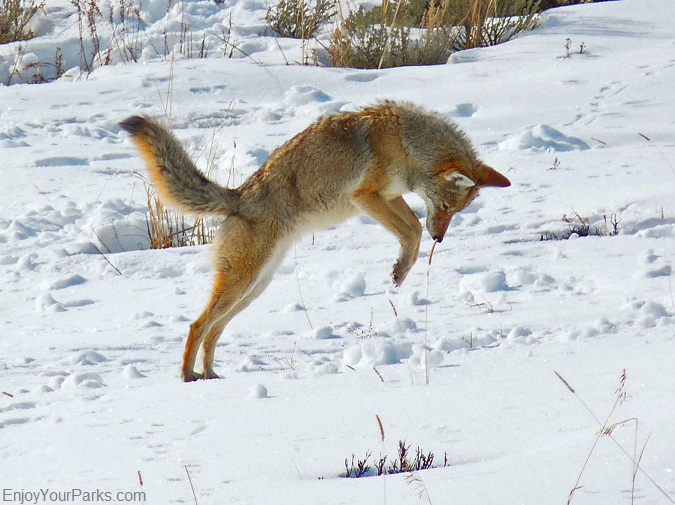 This coyote is "mousing", which means it just located a mouse underneath the snow with its keen sense of smell, and is now pouncing on it. 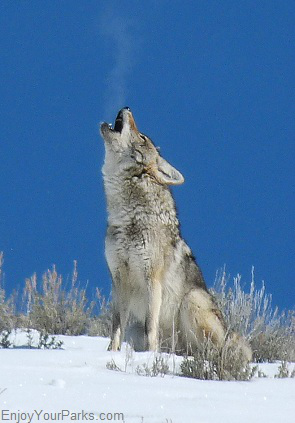 "Mousing" is a very common sight during a winter in Yellowstone Park. The wildlife, the scenery, the cold crisp air, the pure white snow, the snowmobiles, the snow coaches.... it's all a part of a Yellowstone Winter experience that visitors fall in love with and return year after year to enjoy. Winter in Yellowstone Park is an incredible winter wonderland, and this page will show you the most popular things to do during a Yellowstone Winter, and hopefully it will get you excited enough to experience these wonderful things for yourself! You will not only see the amazing contrast between scalding hot geyser pools in sub-zero air temperatures and snow all around, but you will also see the animal world in an entirely different light. 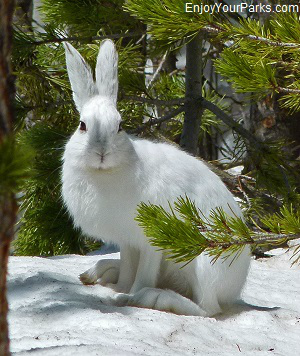 Animals such as this snowshoe hare pictured to the right, have their snow white winter coats to help camouflage them from predators. Bison will have their thick winter coats to protect them from the harsh environment, and the ever-entertaining river otters can be seen sliding down snow banks on their bellies just like little kids playing in the snow. The Yellowstone winter road between Gardiner Montana and Cooke City Montana is a beautiful drive through a winter wonderland. 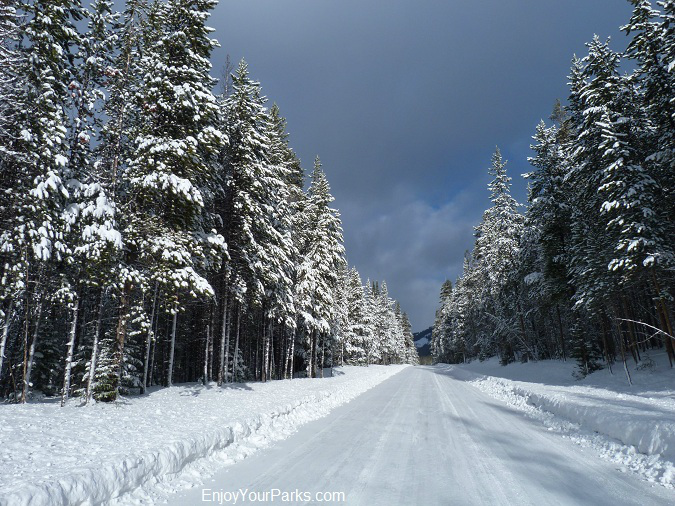 This road is the only Yellowstone Park road that is open during winter in Yellowstone Park. During a winter in Yellowstone Park, all the roads in Yellowstone Park are closed to regular wheeled vehicles other than the paved road between Gardiner Montana and Cooke City Montana (via Mammoth Hot Springs and the Lamar Valley). 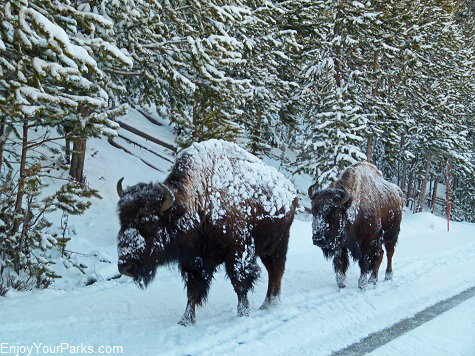 This amazing road in Yellowstone National Park is teeming with wildlife all winter long, including bison, wolves, elk, deer, river otters, bighorn sheep, eagles, coyotes, foxes, and much more. You might even see a grizzly bear that hasn't crawled in its den yet! Everytime you drive this road you will see something different. It's truly a wildlife safari that you really need to experience for yourself! This northern road, which includes the famous Lamar Valley, is open all year long so school buses can take the Cooke City and Silver Gate kids to Gardiner Montana for their schooling, even during the most severe Yellowstone winter. This road is also kept open for all the local businesses in Cooke City Montana and Silver Gate Montana, as well as the 100 or so permanent residents of these wonderful little mountain towns. The snow plows are kept busy all winter long keeping this northern road open, which is an incredible blessing for those visitors who'd like to drive a regular car or light truck into Yellowstone National Park and see not only the beautiful landscape of the magical Yellowstone Winter, but also see the amazing wildlife along this road during the winter in Yellowstone Park. The reason there is a lot of wildlife along this famous road is that this entire northern area receives the least amount of snow accumulation in the entire park. So the northern area of Yellowstone Park is really the only area that a fair number of animals such as bison and some elk can survive without having to completely migrate out of Yellowstone in winter. Also, a large number of bison stay here all winter because there is less snow than anywhere else in Yellowstone Park. And with all these hoofed animals in the area, that is why wolves are in the area as well. 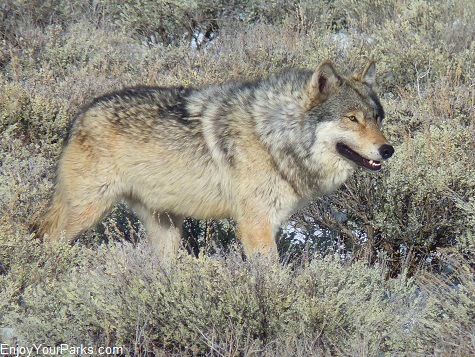 Gray wolves are commonly seen along the road during a winter in Yellowstone Park, especially in the famous Lamar Valley. 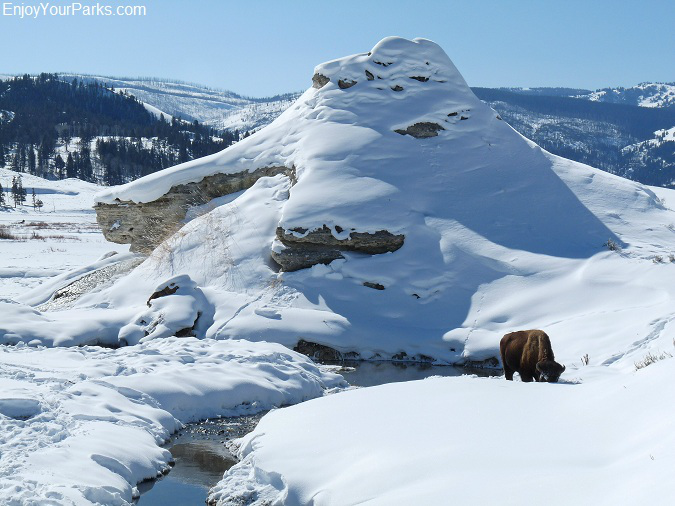 During winter in Yellowstone Park, grizzly bears spend most of the time in their dens. However, sometimes a grizzly won't den up until late December or even mid January, depending on their food supply. And grizzly bears do not technically hibernate. Instead, they fall into a deep sleep. Occasionally a bear will awaken and leave its den for a few days during the middle of a Yellowstone Winter. Once the bear figures out that its not time yet, the bear will crawl back into its den and once again fall asleep. 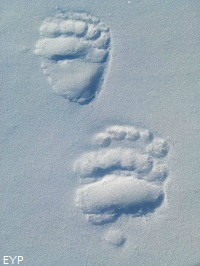 You actually may get to see a grizzly bear during your visit to a Yellowstone Winter. 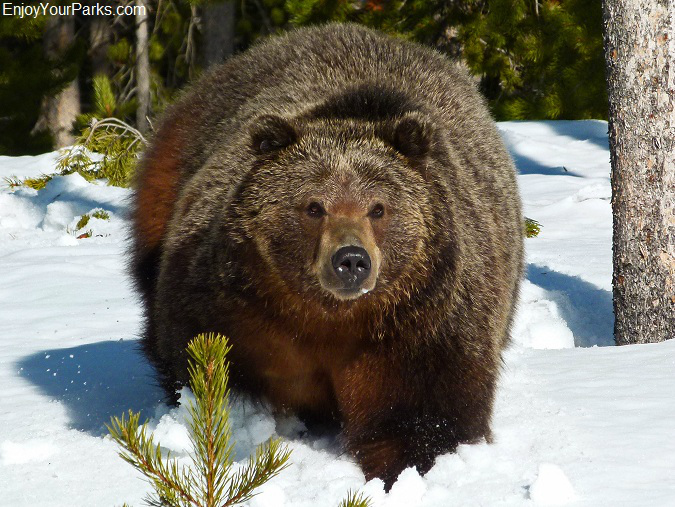 Both grizzly bears and black bears do not actually hibernate. Instead, they go into a very deep sleep. And sometimes a bear will wake up and crawl out of its den for a day or so, and then crawl back in and once again fall asleep. And some grizzlies and black bears in Yellowstone National Park do not go into their dens to begin their "long winter's nap" until late December and even into mid January... so you just might get to see one of these amazing animals during your visit to a Yellowstone Winter! One way is to to stay at either Mammoth Hot Springs Hotel in Yellowstone Park, or stay at one of the many hotels, motels and vacation rentals at Gardiner Montana, which is just a short drive north of Mammoth Hot Springs just beyond the North Entrance to Yellowstone National Park. You can even stay at the Mammoth Campground, which is open all year long... but if you want to try this, make sure you are prepared for extremely cold temperatures! Still another option is to stay at either Cooke City Montana or Silver Gate Montana, which are located at the end of this open northern road. Assuming most of you will either stay at Gardiner or Mammoth Hot Springs, then all that's left is for you to enjoy this amazing road through the northern section of Yellowstone in winter, which includes the world-renowned Lamar Valley. And what's so amazing about this Yellowstone winter road is that every day will be totally different than the day before because the wildlife is always moving. You never know what you're going to see with regard to wildlife, and that's what is so thrilling about this Yellowstone winter road. One day you'll see bison, or some eagles, then the next day you might see wolves, coyotes or foxes, and the following day you might encounter a huge bull elk right along the side of the road. And you might even get to see a playful river otter along the banks of the Lamar River or Soda Butte Creek.... It's truly an unforgettable safari experience! The best way to take this wonderful safari is to leave Gardiner Montana right at sun-up, and slowly drive towards Mammoth Hot Springs. There is quite often bighorn sheep found along the narrow canyon cut by the Gardner River. Elk are also commonly found in this area because this is the migration path for both elk and bighorn sheep during the Yellowstone winter months. You might even get to see a wolf or two along this short drive between Gardiner and Mammoth Hot Springs. 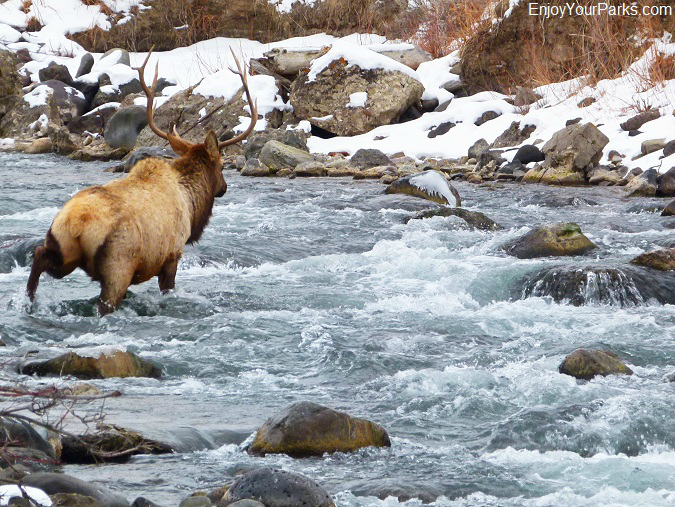 This bull elk is crossing the frigid waters of the Gardner River, which is located between Gardiner Montana and Mammoth Hot Springs of Yellowstone National Park. Once you've reached Mammoth Hot Springs, make sure you check out the Mammoth Hot Springs Terraces. These wonders of nature are especially pretty during the winter months, and are well worth the time to explore. So after you've enjoyed the geothermal features of Mammoth Hot Springs, then take the road heading for Cooke City, via Tower Junction and the Lamar Valley. 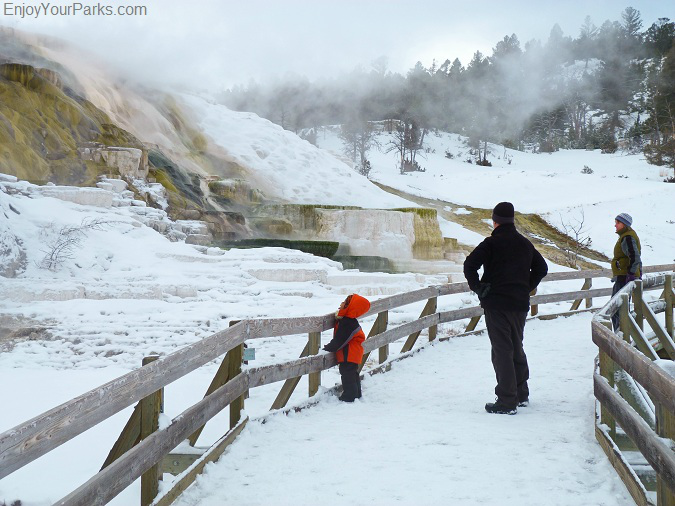 While in Mammoth Hot Springs during your Yellowstone Winter vacation, don't forget to check out the Mammoth Hot Springs Terraces. 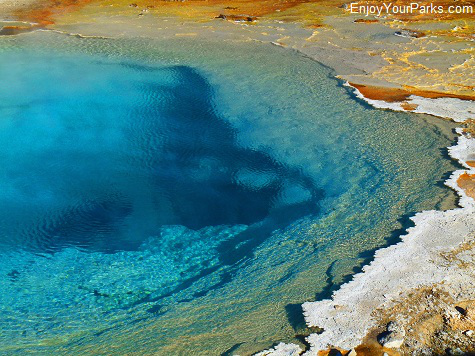 These geothermal features are really fascinating and well worth your time to explore. Once you leave Mammoth Hot Springs and head out on the road towards Cooke City Montana, keep a close look out for elk, bison, bighorns, eagles, wolves, foxes and coyotes. The road between Mammoth Hot Springs and the Lamar Valley can have just as many animals as the actual Lamar Valley, sometimes even more! Anywhere, anytime an animal can appear, so always have your camera ready. When you enter the actual Lamar Valley in Yellowstone National Park, in addition to the animals we just mentioned, also keep a close watch for river otters swimming in the Lamar River and Soda Butte Creek. The Lamar Valley in Yellowstone National Park is world famous for its variety and numbers of wildlife, so if you like to observe or photograph amazing animals fairly close to the road, Yellowstone in winter is the perfect time to experience this unbelievable valley. The Lamar Valley in Yellowstone National Park is a vast, wide valley that is home to an amazing assortment of wildlife, and is world famous because of this. In addition to bison, grizzly bears, river otters, bighorn sheep, black bears, eagles, pronghorn, and more, the Lamar Valley is probably the best place in Yellowstone National Park to see wolves. Take your time as you drive through this wonderful valley, and we recommend that you bring with you either binoculars or a spotting scope in case the animals are a ways off the road. Many animals migrate out of Yellowstone in winter, but many of the bison "stick it out" in the Lamar Valley all winter long, provided that they can continue to reach the grass below the snow. Once you reach the Confluence of the Lamar River and Soda Butte Creek near the area known as "Hitching Post", the road begins to head straight north, following Soda Butte Creek all the way to Silver Gate Montana and Cooke City Montana. 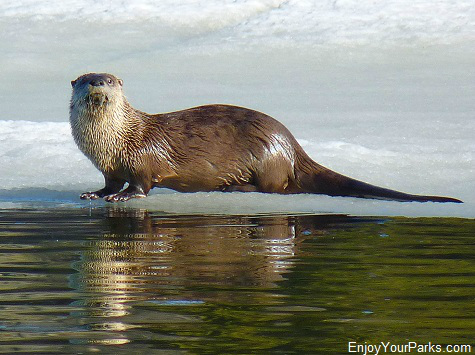 As you follow Soda Butte Creek, keep an eye out for river otters as well as moose. All the way to Cooke City is prime moose habit! This dormant geothermal feature is known as Soda Butte, which is located along Soda Butte Creek between the Lamar Valley and Cooke City Montana. 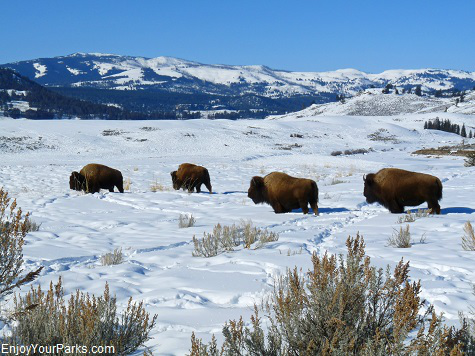 The snow really makes this a classic Yellowstone Winter scene even more incredible. 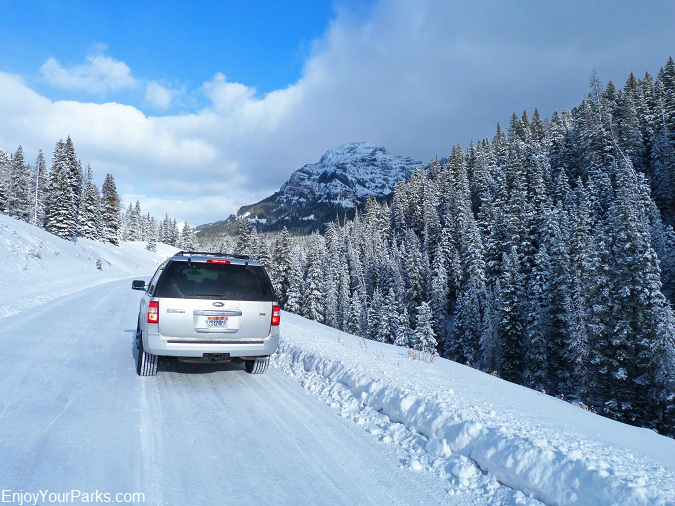 The road between the Lamar Valley and Cooke City is a gorgeous drive during winter in Yellowstone Park. 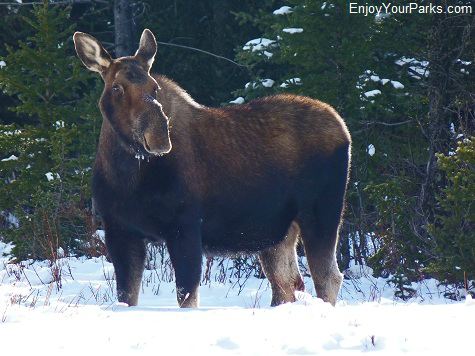 Moose are commonly seen between the Lamar Valley and Cooke City Montana, so keep an eye out for them, especially along the banks of Soda Butte Creek. Once you reach Silver Gate and Cooke City, what we always do is enjoy a nice lunch there and explore these wonderful mountain towns. These two little towns are really fun to hang out in and explore. Once you've had lunch and enjoyed your time in these fantastic little mountain towns, slowly head back to Gardiner, all the while looking for more wildlife. Cooke City and Silver Gate are really fun towns to explore during your Yellowstone winter adventure! And by the way, some of the best snowmobiling in the country is located around SIlver Gate Montana and Cooke City Montana, so if your interested, talk to the locals about renting some snowmobiles! This area truly provides world class snowmobiling. 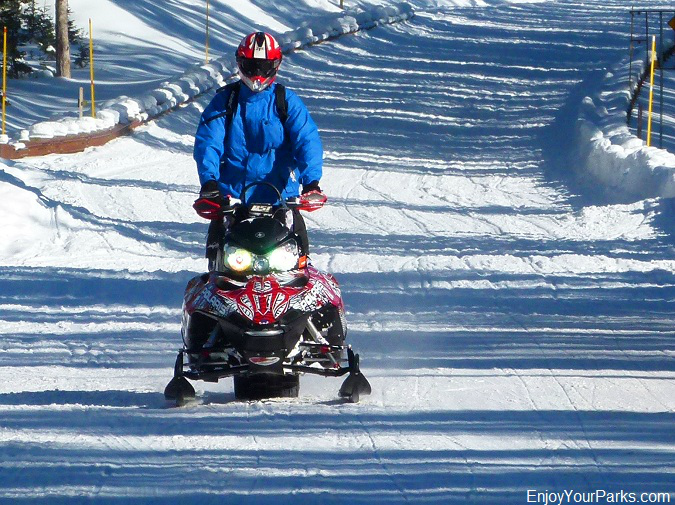 So if you love to snowmobile, you really need to check it out! Snow coaches are a common sight during the winter in Yellowstone Park. During the Yellowstone winter months, Yellowstone snow coaches are available to take visitors on tours of the interior of Yellowstone National Park, and to transport visitors to and from the Old Faithful Area. The interior of Yellowstone Park receives a TON of snow accumulation, much more than the northern section of the park. The Gardiner, Mammoth Hot Springs and Lamar Valley is in a rain shadow, so this northern area does not receive nearly the amount of snow that the interior of Yellowstone Park receives. Plus, the elevation of the interior of the park is higher than the northern section, so this also a reason the interior receives more snow. 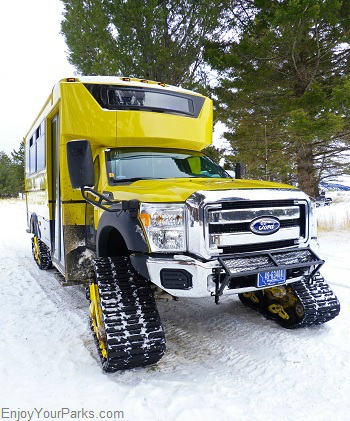 Because there is so much snow accumulation, and because all the interior roads are closed to wheeled vehicles during winter in Yellowstone Park, the only way to see the interior of Yellowstone Park in winter is with snow coaches and snowmobiles. Yellowstone snow coaches provide transportation throughout much of Yellowstone Park, whether you're coming in the North Entrance of Yellowstone Park at Gardiner Montana and Mammoth Hot Springs, the West Entrance at West Yellowstone Montana, or the South Entrance originating at Jackson, Moran and Dubois Wyoming. Most Yellowstone snow coaches begin their South Entrance journey up to Yellowstone National Park at Flagg Ranch, which is between Grand Teton National Park and Yellowstone National Park. 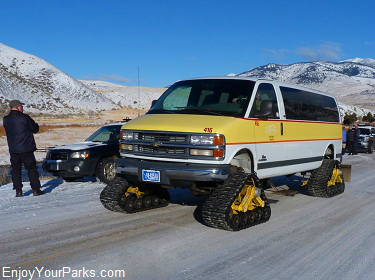 During winter in Yellowstone Park, there are several specially licensed businesses that are allowed to provide visitors snow coach tours and transportation in Yellowstone National Park. 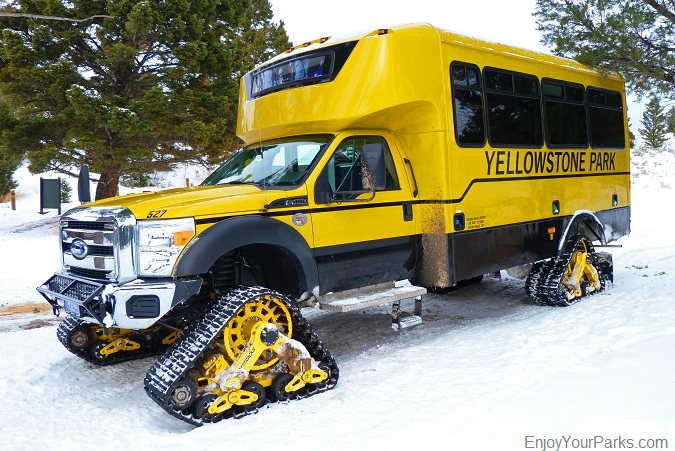 Visit the Yellowstone Park government website for a list of these specially licensed businesses that are located in Gardiner, Jackson, Moran, Dubois and West Yellowstone, as well as the Yellowstone Park snow coaches provided by Yellowstone Park concessioners such as Xanterra. 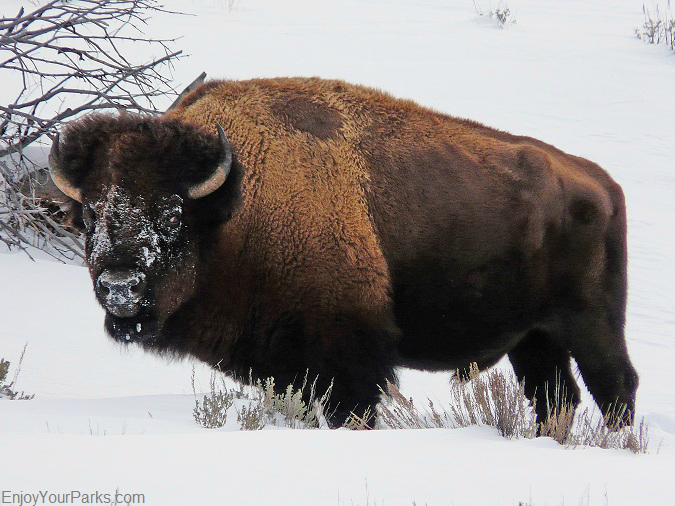 Bison, also known as "American Buffalo", use their face to remove the deep snow so they can get to the grass that is desperately needed for their survival during a long Yellowstone Winter. 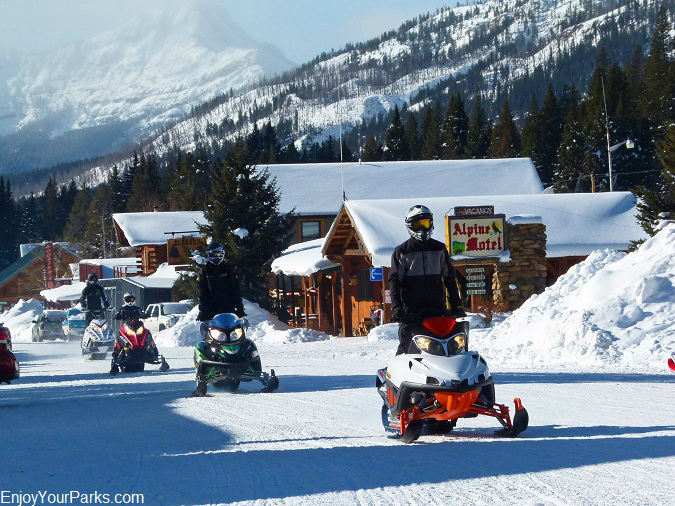 Snowmobiles are extremely popular during winter in Yellowstone Park and the surrounding region. Besides Yellowstone snow coaches, the only other means of transportation during a winter in Yellowstone Park is snowmobiles. 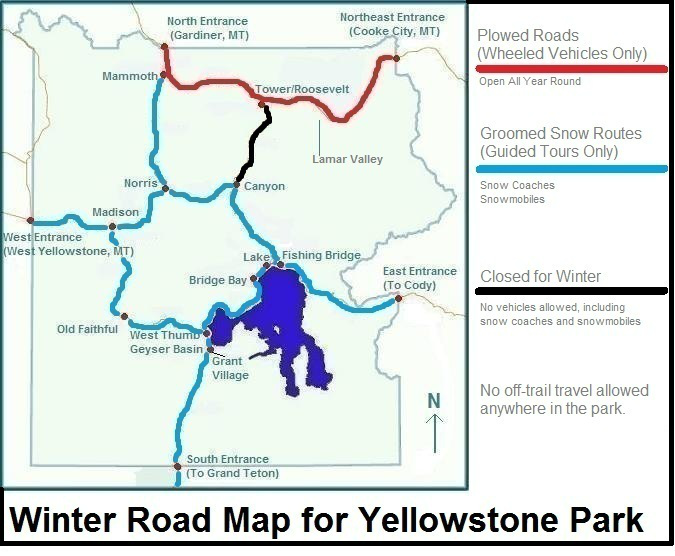 Just like the snow coaches, the National Park Service has specially licensed a handful of businesses, which allows them to take a very specific number of visitors on snowmobile tours in Yellowstone National Park. The towns where these businesses are located are West Yellowstone Montana, Cody Wyoming, Jackson Wyoming and Moran Wyoming. There are also snowmobile tours provided by the Yellowstone park concessioners Xanterra that are located inside Yellowstone National Park. 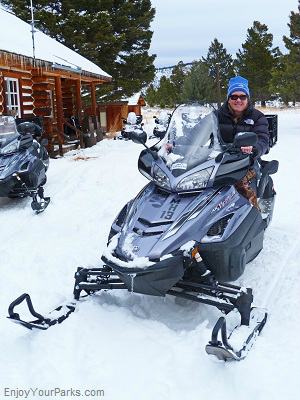 Snowmobiles are a great way to explore the interior of Yellowstone in winter. Snowmobiling in Yellowstone National Park is an age-old tradition, and something we highly recommend. 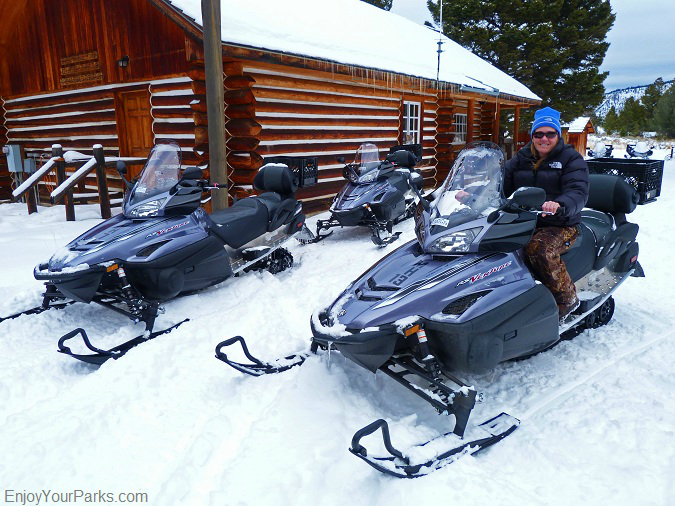 Snowmobiling in Yellowstone Park is a very special experience because you're not just seeing a Yellowstone winter wonderland, but you are actually IN this magical wonderland. You are actually feeling the crisp cold air and seeing the beauty of a Yellowstone Winter without any glass between you and this beauty. There is something about "being in it" instead of "almost being in it". Now of course the downside is that if it's really cold out or storming, you're in for quite a "treat" whereas those folks sitting in a snow coach are in a heated cabin. And if it begins to snow really hard or if it gets really cold, you'll probably be wishing you were in a snow coach instead of sitting on a snowmobile out in the harsh elements. All in all however, snowmobiling in Yellowstone Park is a wonderful experience and we highly recommend it. 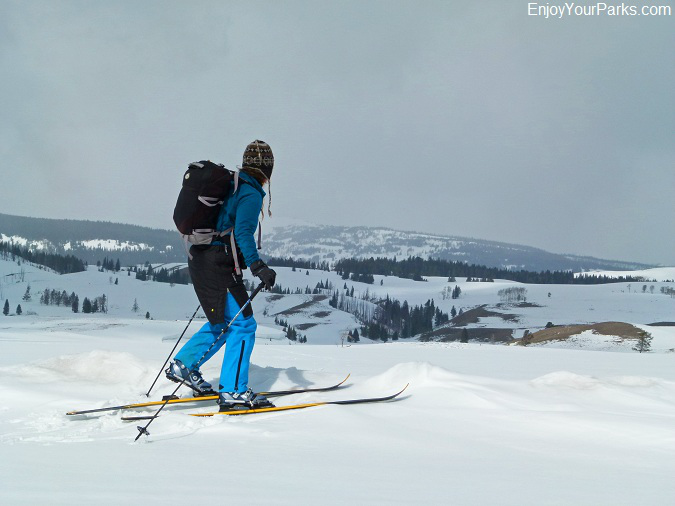 Cross Country Skiing in Yellowstone National Park is an extremely popular Yellowstone winter activity. Cross Country Skiing is also an extremely popular activity during winter in Yellowstone Park, and there are many great ski trails throughout Yellowstone National Park in winter that are very accessible. 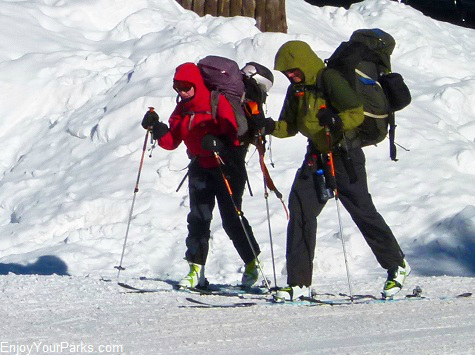 And by the way, there is a list of Cross Country Ski Concessioners on the National Park Service Website for Yellowstone National Park if you'd like to go on a guided ski trip. 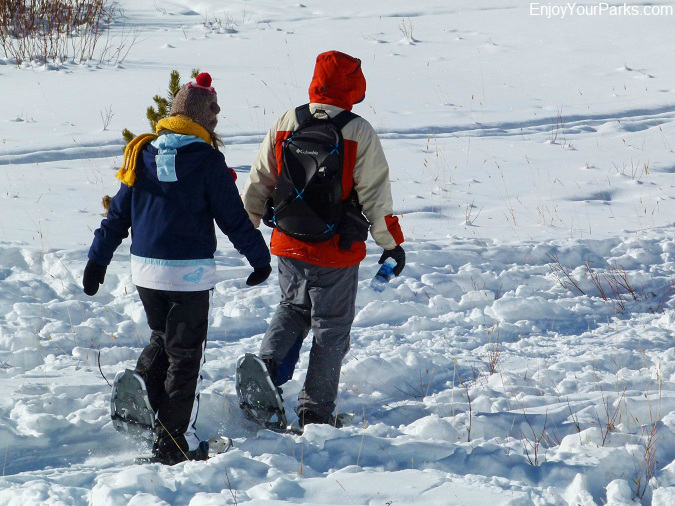 Another popular activity during a winter in Yellowstone National Park is snowshoeing. Just as it is for cross country skiing, there are plenty of places to enjoy a fun day on the snowshoes. What towns are most commonly considered to be "headquarters" for your Yellowstone winter vacation? Well, we already mentioned two very popular ones, which is Gardiner Montana (North Entrance) and Mammoth Hot Springs in Yellowstone Park. Both these towns are especially popular for those wanting to drive the northern road looking for wildlife. Cooke City Montana and Silver Gate Montana are also good options if the northern open road is where you want to spend your time. Another extremely popular town to call "home" during your Yellowstone Winter vacation is West Yellowstone Montana, especially if you're wanting to explore the interior of Yellowstone Park. West Yellowstone Montana is located at the West Entrance, which is the busiest entrance to Yellowstone, whether it's summer or winter. West Yellowstone is the main route for snowmobiles and snow coaches entering the interior of Yellowstone in winter. There are many hotels, restaurants, gift shops, snow coaches operators and snowmobile rentals located in West Yellowstone Montana, and because it's so close th the action, this entrance town is probably the most popular town to stay in during your Yellowstone Winter Vacation IF you are focused on the interior of the park. 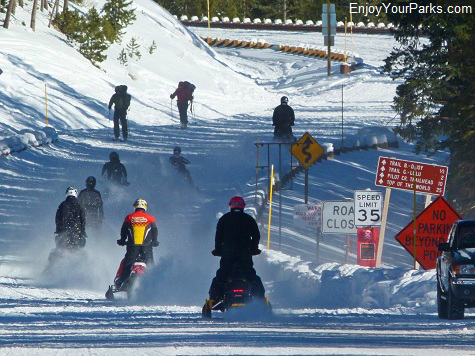 West Yellowstone Montana is also known as the "Snow Mobile Capitol of the World" with good reason... there are literally hundreds of miles of world-class snowmobile trails around this famous area. HOWEVER, if you want to see a lot of wildlife, then your best choice is to stay at Gardiner Montana or Mammoth Hot Springs so you can have easy access to the open northern road between Gardiner and Cooke City via the Lamar Valley. And for those of you who would like to "get away from it all" and experience staying at a tiny remote mountain town, then Silver Gate Montana and Cooke City Montana are great choices. These two mountain towns are located just beyond the Northeast Entrance to Yellowstone Park, and are only about 15 miles north of the Lamar Valley. There is also the wonderful town of Cody Wyoming, which is 50 miles east of the East Entrance of Yellowstone Park, as well as Jackson Wyoming, which is located about 10 miles south of Grand Teton National Park. These towns are amazing world-class tourist towns, but they are definitely farther away from the action than either West Yellowstone, Mammoth, Gardiner, Cooke City or Silver Gate Montana. This is the popular Old Faithful Snow Lodge located at the Old Faithful Area of Yellowstone National Park, and it is truly the center of all activity throughout the interior of the park during winter in Yellowstone. 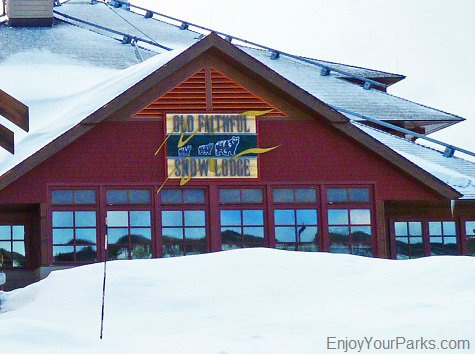 At the Old Faithful Snow Lodge in the Old Faithful Area, you'll find great lodging, restaurants, gift shops, and also where a large number of snowmobile tours and snow coach tours originate. 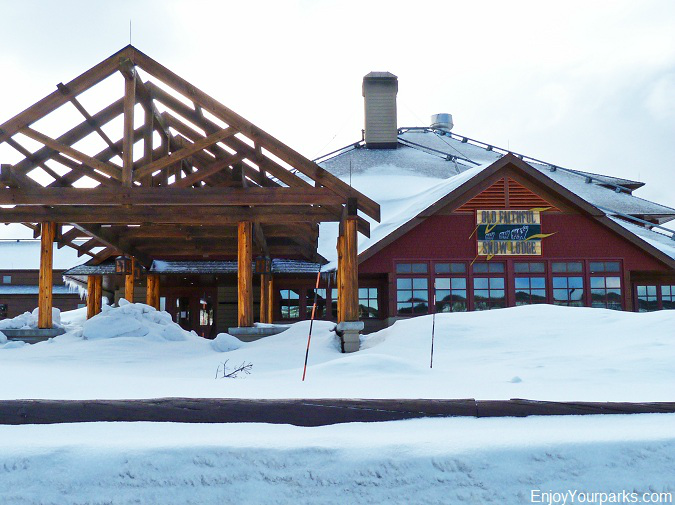 The Old Faithful Snow Lodge is the ONLY place available for lodging throughout the interior of Yellowstone National Park during the Yellowstone winter months. 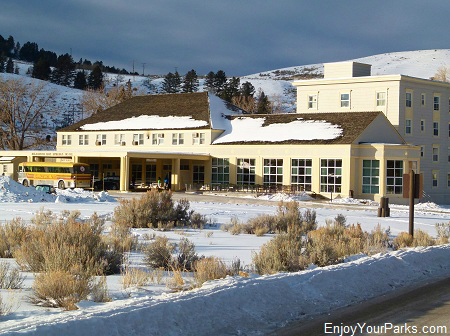 The only other place in Yellowstone Park in winter that provides lodging is Mammoth Hot Springs, which is located at the northern border of Yellowstone National Park. Old Faithful Inn is closed for the winter season, but you can look into the windows and see the furniture all covered up in white sheets... it's kind of spooky but really cool at the same time. The Old Faithful Snow Lodge is a fairly new structure, and is really a wonderful place to stay. We've spent a few New Years there and really enjoyed it. The decor is a cross between modern version of "arts and crafts", also known as "mission", and rustic pine. We really like spending time in this beautiful lodge, and we are confident you will too! 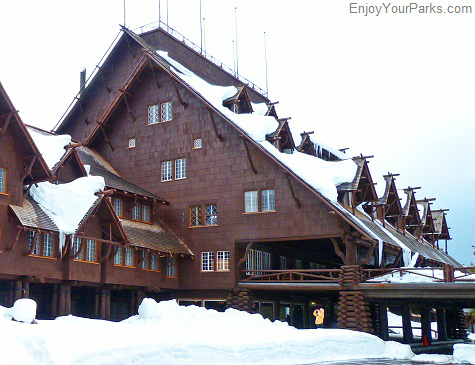 Old Faithful Inn is closed during winter in Yellowstone Park, but it's still a wonderful sight from the outside! The Old Faithful Inn is such an iconic image of Yellowstone National Park, no matter if it's summer or winter in Yellowstone. But there's something about this grand old building during the winter that makes it kind of eerie and intriguing, especially when you look into the windows and see the furniture covered in ghostly white sheets. The Old Faithful Area during a winter in Yellowstone is incredibly magical. Watching Old Faithful Geyser erupt in winter is amazing, as well as seeing all the geysers in the Upper Geyser Basin with all the snow surrounding them. 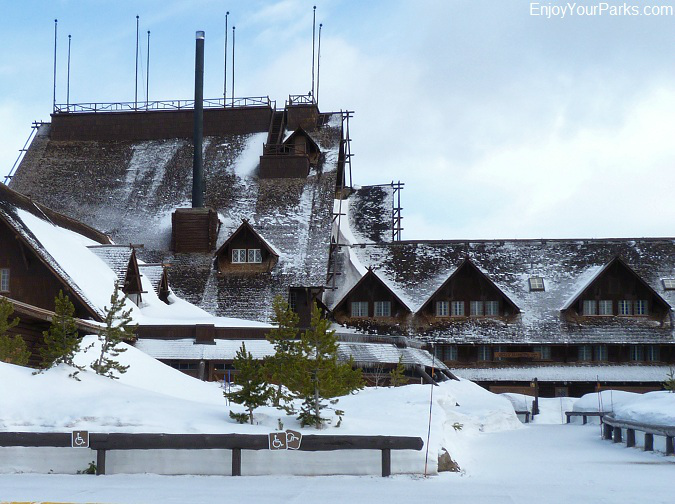 And even though Old Faithful Inn is closed, it's still wonderful to see it covered in snow. The bottom line is that the Old Faithful Area is an extra-special place during the winter in Yellowstone Park, and we highly recommend that you spend time there. Again, the Old Faithful Area is the center for all activity in the interior of Yellowstone Park in winter. No matter where you're at in the park, all roads lead to Old Faithful. During your Yellowstone Winter vacation, Yellowstone snow coaches and snowmobiles will get you to all the major geyser basins, such as Upper Geyser Basin, Geyser Row (which includes Black Sand, Midway, Biscuit and Lower Geyser Basins), and Norris Geyser Basin. These geysers are amazing no matter what time of year it is, but there's something about seeing these boiling geothermal features in the dead of winter that makes these geysers even more amazing. 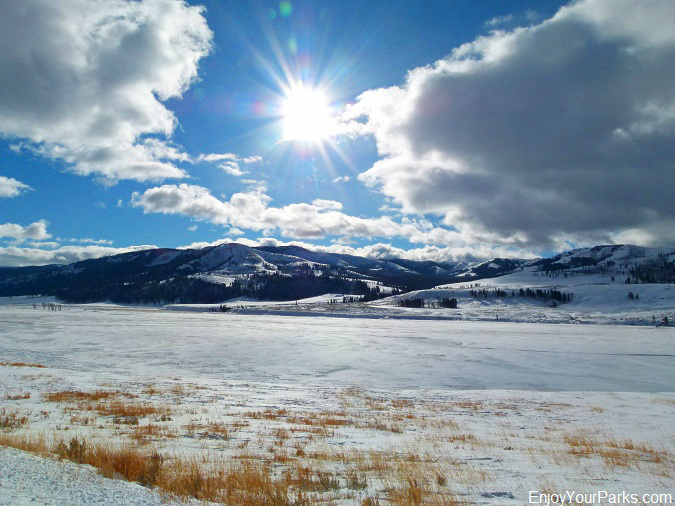 Winter in Yellowstone Park is truly a magical place that you will really enjoy exploring! 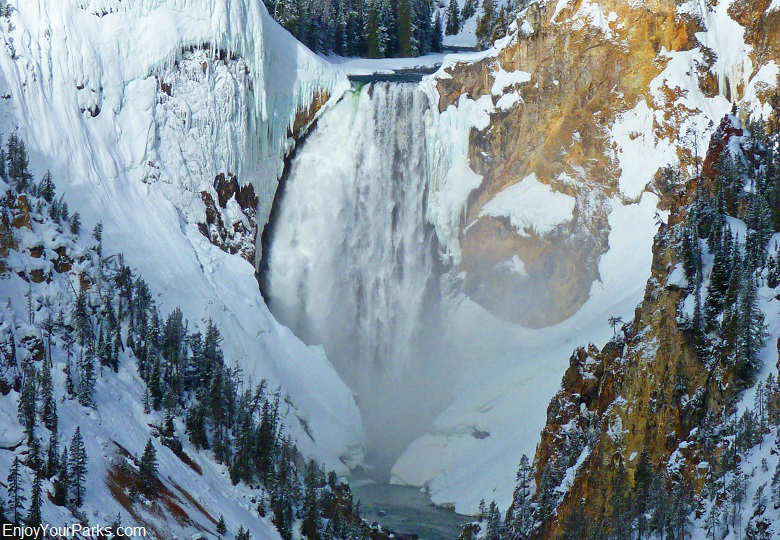 The Lower Falls of the Yellowstone, which is located in the Grand Canyon of the Yellowstone, is a spectacular sight during your Yellowstone winter vacation. 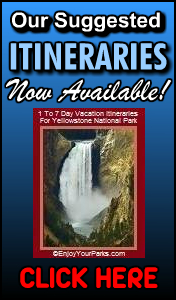 The Grand Canyon of the Yellowstone is a very popular destination for visitors on snow coach tours or snowmobile tours. The views from the rim are absolutely breathtaking, especially the view of the Grand Canyon of the Yellowstone from Artist Point. 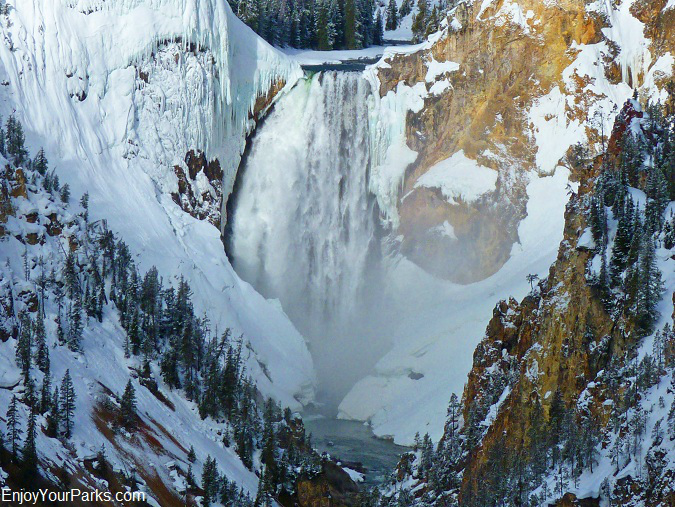 The Lower Falls develops an incredible spectacle of ice that becomes more and more dramatic as the Yellowstone winter lingers on. And the yellow colored rocks of the Grand Canyon of the Yellowstone provide a stark contrast to the white snow, and the results are a truly magical wonderland of color. 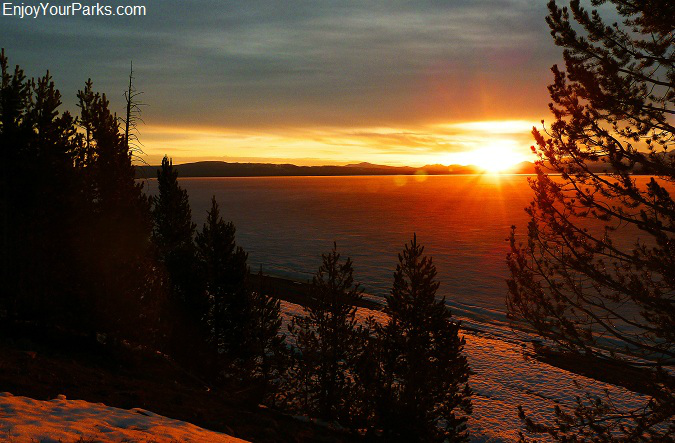 A Yellowstone winter sunrise over a frozen Yellowstone Lake in Yellowstone National Park. Seeing this massive frozen lake in the dead of winter is an unbelievable experience. 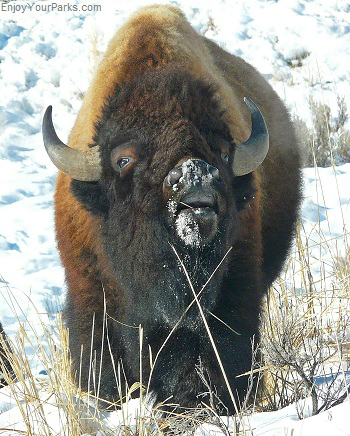 If you really want to hear "total and absolute silence", visit Yellowstone Lake during your Yellowstone winter vacation. The Yellowstone Lake Area in Yellowstone National Park is truly a wonderful place to visit during your Yellowstone Winter adventure. Yellowstone Lake is monstrous, and it is completely covered in ice throughout the entire Yellowstone winter season. Snow coaches and snow mobiles can get you there, and the views are amazing. 5 degrees Fahrenheit. It was dead calm with absolutely no sound..... Then we began hearing eerie strange sounds that seemed to come from miles away and quickly got closer and closer to us. The sound was like a deep "BOING" sound that lasted for several seconds at a time. We finally figured out that what was actually happening was the ice was cracking throughout Yellowstone Lake, and it was the strangest sound we've ever heard! And by the way, keep an eye out for river otters along the shore of Yellowstone Lake. Several years ago we watched a family of river otters slide down an icy slope like a playground slide. Once an otter reached the bottom, it would go back up the slope and slide down again! This went on for about 20 minutes. 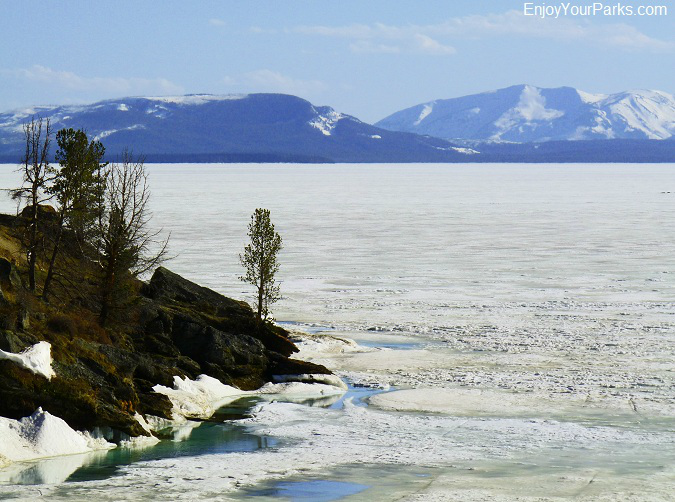 The Yellowstone Lake Area is really fascinating during the Yellowstone Winter Season, and both snow coaches and snowmobiles can get you there! 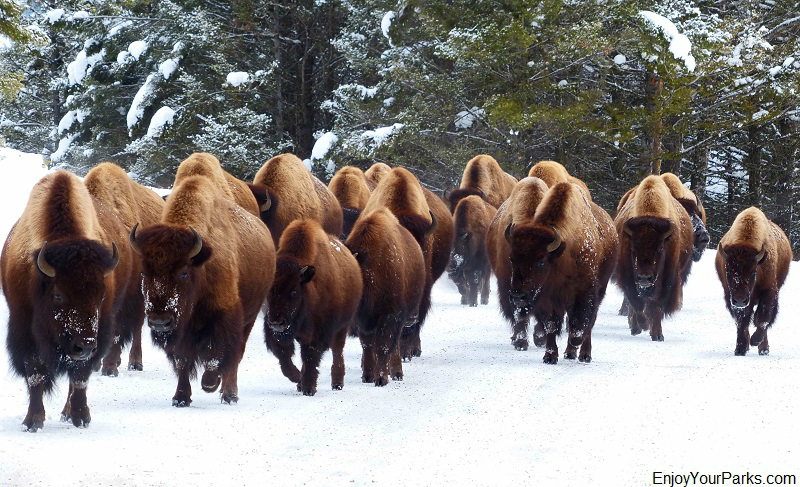 During the winter in Yellowstone Park, most of the hoofed animals such as elk, deer, bighorn sheep, moose and antelope have all migrated out of the interior of Yellowstone Park, but there are some bison who choose not to migrate but instead "stick it out" for the entire Yellowstone winter. A fair number of these bison can be seen in the Old Faithful Area and Madison River Area. Wherever there are hoofed animals hanging out, you will also see predators such as eagles, wolves and coyotes who are waiting for an opportunity. So while you're on your Yellowstone snow coach tour of the interior of the park, make sure you keep a watchful eye for these animals... they can really make your Yellowstone winter vacation a memorable one. Be Prepared For Extreme Weather! During the winter in Yellowstone Park, it goes without saying that you really need to be prepared for extreme weather conditions at all times while snowmobiling, motor coaching, skiing, snow shoeing, or driving. Sub-zero temperatures are very common during the winter in Yellowstone Park, as well as heavy snowfalls, high winds and blizzards. Not being prepared for extreme weather can be life-threatening, so make sure you're prepared!